When recycling old computers, the hard drive must be destroyed, the data must be deleted or made unreadable so any data on the drive is unreadable and not potentially released into the wild. Many users have personal information on their hard drives, and in many cases they are not even aware of what personal information is stored on the hard drives. (This also applies to removable storage media, such as old floppy disks, USB sticks, backup tapes, backup CDs, backup DVDs, etc. Electronics, including computers, must be disposed of properly as they contain many toxic materials that must be properly handled. Do not throw old electronics in the trash. We like and use BestBuy’s recycling program as there is a store very close to our offices, and we can also drop off old batteries, UPSs, and other items there. Be aware that Best Buy charges a nominal fee for recycling computers, but you are issued a BestBuy gift card in the same amount. The first steps are to remove the hard drive from the old computer and recycle the old computer (see above). To destroy the drive so no data is recoverable, there are two optional steps and one mandatory step. The first two steps are optional EXCEPT for government agencies, businesses with trade secrets and financial information and client lists, health care providers, physicians and dentists, anyone who stores Social Security numbers or customer credit card numbers, and the most paranoid. Step One: Run a disk wipe program on the hard drive. We use and recommend Darik’s Boot and Nuke (DBAN) although there are many others. Step Two: Degauss the hard drive using an NSA approved degausser. (expensive for home and small business use). 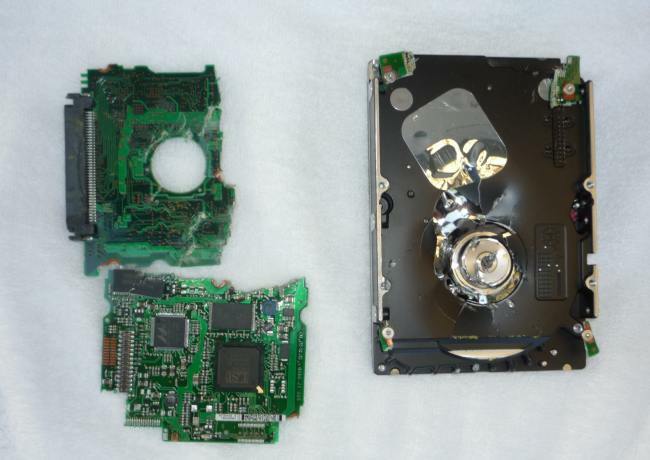 Step Three (this step is Mandatory): Physically destroy the hard drive’s pins, circuit board, and platter inside the hard drive. Wear eye, arm, foot and leg protection. We like and use this tool: Stanley Hand Tools 55-119 FatMax Functional Utility Bar. Get a good crosscut shredder and shred ALL credit card bills, all bank statements, all mail and all package labels with name and address. If you still use paper checks, only print your first initial and last name on your checks (do not put your address, phone number or driver license number on your checks). Pay for a reliable monitoring service to monitor your credit reports and alert you to all credit inquiries using your name or SSN. We like IdentityGuard offered through Costco. Install, use, and keep updated good antivirus and malware software. Install and keep updated a modern web browser and pay attention to browser warnings about spoof sites, malware sites, etc. We also recommend using an add-on like NoScript.